Seeds of Intention by Andrea Thome is a well-crafted contemporary romance with great characters and a beautiful setting. After his boss and owner of one of the famous resorts in the country suffers a stroke, Garrett Oliver finds himself being groomed to become the master gardener. Things just seem to fall into place for him and taking his long-distance relationship with his college sweetheart to the next level seems possible now. Heartbroken, Willow Armstrong has just returned to Knoxville to take care of her ailing father when she lands the job at the resort. She would be Garrett’s boss. These two souls are bound together by their work, but as they work together an undeniable attraction begins to develop between them. The reader watches them as the intensity in their attraction for each other grows. The question is: can Garrett forget the love of his life for his boss? Realistic and intelligently plotted, Seeds of Intention takes the reader on a ride into the inner workings of the hearts of the characters. The setting is colorful, captured in vivid prose and powerful descriptions, from the interior décor of the resort to the surrounding beauty of the Smoky Mountains. Readers will marvel at the natural beauty of Walland, Tennessee, and at the images the author offers them. The narrative voice is strong and it grabs the reader’s interest from the very beginning. Andrea Thome has a great gift for character and even though I never read the first book in the series, it wasn’t hard for me to connect with the characters and to feel like part of their world. Great pacing, compelling characters, and masterly handling of themes! Garrett Oliver thinks he has his life all in order – a great job working in the heirloom gardens of a premier resort in Tennessee and a girlfriend he hopes will accept his proposal of marriage in Seeds of Intention by Andrea Thome. Things don’t go exactly as planned, though, and the arrival of a new General Manager, the beautiful and charming Willow Armstrong who has her own baggage, adds some different complications. Among his friends who are the resort’s proprietors, Garrett has plenty of support as he comes to terms with his disappointment, and an instant attraction to Willow confuses him. The Fall season moves along with pleased guests and more surprises as Willow is asked to find a new location for a similar resort in Colorado. With the opportunity to have someone go with her, Willow asks Garrett since their relationship is becoming more serious. The trip goes well with a number of twists and turns so big decisions need to be made. It only goes to show that you never know what the future may hold. 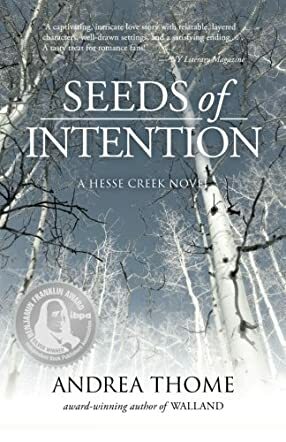 As the second book in the Hesse Creek Series by Andrea Thome, Seeds of Intention is a perfect stand-alone story. Building on Walland, the first volume, the beginning of Seeds of Intention supplies enough explanation for you to jump right into the story line without feeling something is missing. The writing is refreshing, the characters well-developed and the plot full of action and intrigue. Emotional issues are also sprinkled throughout the story that add depth to the characters and sincerity to their interactions. A thoroughly enjoyable story that I couldn't put down. The flow is perfect and the characters are both strong and vulnerable, which makes them quite believable. This is a delightful book that could easily be enjoyed by a crackling fire or on the beach, leaving you with a smile and a sense of anticipation for more to come. Seeds of Intention, the sequel to Walland, by Andrea Thome sees Garrett Oliver apprenticed to the master gardener at the luxury holiday resort of Walland in Tennessee, on a promise that he will take over when Finn Janssen retires. Brought up in Washington State, Garrett is prepared to adjust to a very different climate in the shadow of the Smoky Mountains, and hopes to persuade girlfriend, Lindsay, to agree to join him from Seattle when she graduates: the ring is in his pocket. Willow Armstrong has her own reason for taking the job of general manager at Walland, where she becomes Garrett’s boss. An instant magnetic attraction draws the couple together, and “personal baggage” pushes them apart. Will Lindsay claim her man, or free him for Willow? If she does, dare Willow surrender her heart? Reading Seeds of Intention is like taking a luxury break with the added bonus of seeing what goes on behind the scenes to keep guests fed and entertained, the descriptions are so vivid. Andrea Thome gets inside the heads of her main characters, Willow, Garrett, Wyatt, India, Susan, Finn, Violet, Rex, and Logan, making for a rounded picture, a fast pace, a touch of mystery, and sexual tension stretched like taut elastic. Graphic “open door” bedroom scenes are supported by a powerful story that I enjoyed from beginning to end. Seeds of Intention is a beautifully written sequel that stands alone. Read on the beach, in bed, or by the fire, this novel will captivate readers and draw them back to a very talented author. Seeds of Intention by Andrea Thome is rightly entered as chick lit, a compelling story of an unusual romance in unusual circumstances. Readers are introduced to two rock solid characters, Garrett Oliver and Willow Armstrong, both working at a famous resort in Tennessee. For Garrett, training to become the Master Gardener of the resort is something that resonates with the innermost aspirations of his heart. Little does he know that Willow Armstrong, the woman who soon becomes his boss, will cast a powerful spell over him and circumstances do not help. But can they be together or could the attraction lead them beyond themselves and the already laid out plans each of them has created for their lives? I enjoyed the way Andrea Thome introduces her characters, offering readers telling glimpses into their backgrounds and letting them understand their nature. “Garrett Oliver had a knack for being in the right place at the right time. Or the wrong time...” But “Willow Armstrong was a nervous wreck. Looking around, it wasn’t lost on her that she was the only female candidate in a sea of capable-looking men.” The author doesn’t waste any time in making the reader know the kind of key characters they will be following and this already allows the reader to pose questions related to how the characters will deal with conflict or handle their challenges. The writing is excellent and the reader will be pulled in by the vivid descriptions. There are very interesting dialogues and such dialogues enhance the plot and character development. The plot is fast-paced and character-driven. The author has a skill for exploring human emotions and building characters that readers can easily identify with. Seeds of Intention is a combination of chick lit and contemporary romance, a page-turner with characters that are impossible to ignore. Seeds of Intention by Andrea Thome is a rich chick lit plus contemporary romance, overflowing with excellent prose and many dramatic episodes. Garrett Oliver is finally doing his apprenticeship as a gardener in the popular Tennessee resort. At last, he could be headed for what would completely change his life, but the only problem he has to face is his boss, Willow Oliver, “the only female candidate in a sea of capable-looking men.” The attraction that both feel for each other begins to grow steadily and it could get out of control. How can they handle this without putting their other interests in jeopardy? Andrea Thome has a gift for character and plot and the reader will be stunned at how she explores the psychological aspects of the story. Her characters are interesting and the story is captivating on many levels. The writing is beautiful and it features wonderful prose with excellent descriptions that completely absorb the reader into the story. The romance doesn’t just happen and the reader is keen to see how the attraction between Garrett and Willow develops. The plot is unique and the reader can feel the originality in both the writing and the plot. The author explores the backgrounds of the characters without being stuffy, allowing readers to discover them one level at a time. Then the setting, oh the setting is so beautiful and the reader won’t fail to feel like part of the drama. There is a lot of entertainment in Seeds of Intention, an absorbing story that compels the reader to keep on turning the pages until the final period. A very satisfying read, indeed! Seeds of Intention: The Hesse Creek Series, Volume 2 is a contemporary women’s fiction novel written by Andrea Thome. After completing his university studies, Garrett Oliver had traveled east to work at the Walland resort as bell staff. While his degree was in the agricultural sciences, and his passion was for expanding his knowledge of the heirloom techniques his grandfather had shared with him as he was growing up, Garrett took an unrelated position for which he was admittedly overqualified, because of Finn Janssen, whose wife, Susan, owned and operated the Walland resort. Finn was a master heirloom gardener, and Garrett spent his spare time learning from the man who quickly became his mentor and friend. When Finn’s heart attack prompted thoughts of retirement, he felt Garrett was the right person to continue his work. Willow Armstrong was also moving east -- she was coming back home to help care for her sick father in Knoxville. She had fallen in love with the mountains of Utah while attending college, but had decided to postpone her plans for living out West while her family needed her. The general manager position that India Hinch was interviewing applicants for would be the perfect opportunity for Willow. Fortunately, India thought so as well, and Willow soon found herself immersed in the preparations for the Smoky Mountain Table Event. Andrea Thome’s contemporary women’s fiction novel, Seeds of Intention: The Hesse Creek Series, Volume 2, continues the story of the extended family whose connection is the Walland resort in rural Tennessee. While the author gives enough background information for this novel to be read on its own, I’d recommend that readers begin with the first book, Walland, to get a real feel for the characters and the unique and special place they call home. Seeds of Intention revolves around two newcomers, Garrett and Willow, and follows as their initial attraction is transformed into something more powerful and enduring. Thome’s characters have dimension and authenticity, and their stories are compelling. The author also weaves in the issues of retirement, senior caregiving, long-distance relationships and other socially relevant topics into this appealing romantic novel. Seeds of Intention: The Hesse Creek Series, Volume 2 is highly recommended.